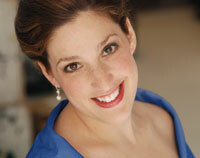 Acclaimed Pittsburgh Opera soprano Deborah Selig performs in concert Friday, April 8, at 7:30 p.m. in the University of Wyoming Fine Arts concert hall. Tickets cost $18 for general admission and $15 for students and senior citizens. Tickets are available at the Wyoming Union and Fine Arts Center box offices, or online at www.uwyo.edu/finearts. Call (307) 766-6666 for ticket information. Thursday, April 7, Selig will join the UW Symphony to perform Richard Strauss's "Vier Letzte Lieder" at 7:30 p.m. in the Fine Arts concert hall. Cedric Reverand, UW Cultural Programs director, says Selig was selected following a lengthy search for a soprano to perform with the UW Symphony Orchestra. "And then, at the Central City Opera, we saw Deborah Selig as Zerlina in Mozart's 'Don Giovanni,'" Reverand recalls. "At the end of one of her arias, ‘Vedrai carino,' there was a huge, audible sigh from the audience. We knew we had our soprano." One reviewer described her Zerlina as "absolutely stunning." Selig holds an artist's diploma from the Cincinnati Conservatory of Music and a B.A. degree with honors from the University of Michigan, where she majored in voice performance and English.